What should I expect during my paramedical exam? A paramedical examination usually includes the recording of height, weight, blood pressure and pulse. The exam may also include the collection of blood, urine, oral fluid, and an EKG and/or X-ray, depending on the insurer’s underwriting guidelines for your age and insurance amount. Additionally, if a medical history interview is required, this will be completed either over the phone or during the time of your exam. All of this information allows the insurance company to perform a comprehensive evaluation of your current health. To find out more information about how to prepare for a life insurance exam, watch this video. ExamOne paramedical professionals perform examinations at one of our convenient ExamOne or Quest Diagnostics locations. If desired, the exam may be performed at your home or workplace. You choose the time and place most convenient for you. The examination time can last from 15 to 45 minutes depending on the required services. Any specimens obtained during the examination are sent to Quest Diagnostics or another designated laboratory and the results are forwarded to the insurance company for assessment. ExamOne professionals are not aware of the tests performed on the specimen(s) at the laboratory and do not receive the test results. If you have any questions regarding your application or your test results, please contact your insurance agent or the insurance company. The paramedical examination results and any additional requirements are forwarded to the insurance company. You will be contacted if additional information is required. We also encourage you to take our survey to let us know about your exam experience. Who do I contact with questions about my scheduled appointment? Please call the number you were provided at the time of scheduling or when your appointment was confirmed. 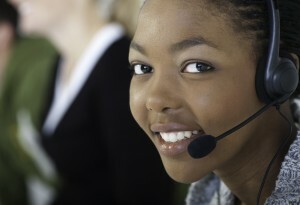 Additionally, you can call our Customer Solutions Group 1.877.933.9261, 7:30 a.m. – 5:30 p.m. CST or provide us your information at https://www.examone.com/about-us/contact-us/. Most applicants can access their laboratory results via our secure website. * If you are unable to access your results, you can obtain a copy of your results by contacting your agent or insurance company. Watch an educational video on the the exam process and resources available to you. * This service is subject to insurance company participation. Many companies offer a customized service that they administer. 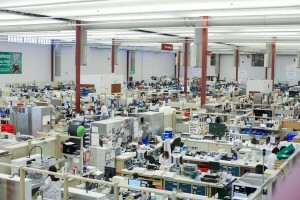 Please contact your insurance agent or company to find out about the availability of your laboratory results. 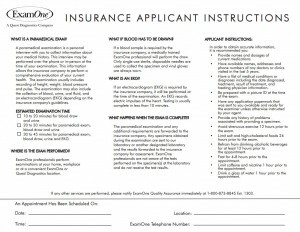 If your insurance company participates in ExamOne’s service, your results should be available in 7 to 14 days.